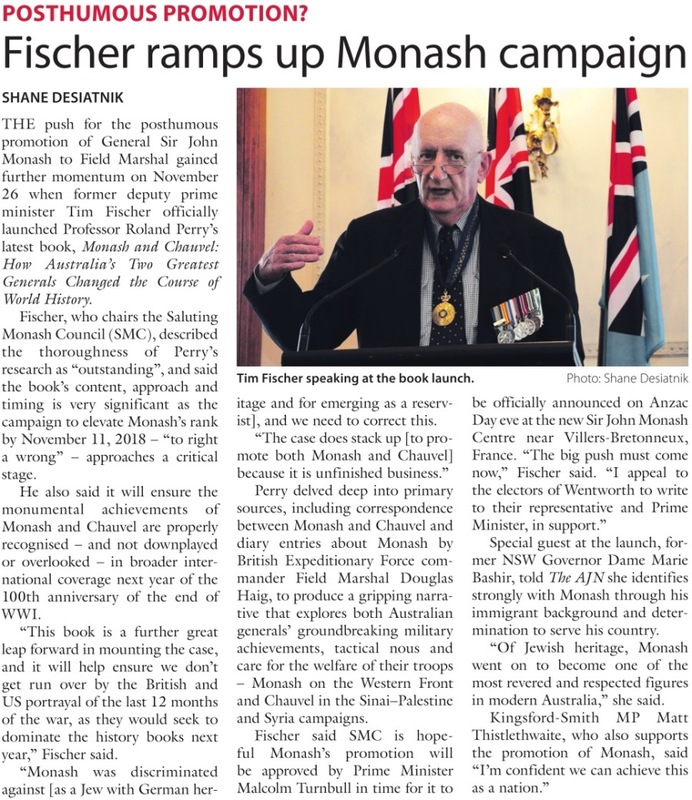 At the Royal Automobile Club, Sydney, on the morning of Sunday 26 November 2017 an iconic new book was launched by Tim Fischer and supporters of the Monash for Field Marshal Campaign. The book "Monash and Chauvel" chronicles the overlapping exploits of these two native born and trained Australian generals who on the key fronts of World War 1, in command of Australian volunteers, by demonstration and action ensured victory for democracy. Ross Fitzgerald (emeritus professor Griffith University). Roland Perry talks on his new book (a 36 minute MUST WATCH for students of Australia’s history). Tim Fischer launches Roland Perry’s book. The launch was supported by many fine speeches: Neil Bavington introduced the proposal for Monash’s posthumous honour; our Northern Territory representative Jeff Dunn told of support in the far reaches of the nation, Tim Fischer spoke of the Jerilderie Proposition, Matt Thistlethwaite of his epiffany at Villers Bretonneux and Kate Ashmor of the proposal to rename the federal electorate of "Melbourne Ports", "Monash". The MC was Bob Joseph, the event organised by John Moore. The governor emeritus of NSW Marie Bashir was at the launch. The book was on-sale, and Roland Perry signed copies for those present. Roland Perry’s speech is well worth listening to, it will certainly make you want to go out and secure a copy of the book. He emphasises that in 1918 the French, British and Americans will be out to seek the role as war winners. It will be hard for Australia to stake its pivotal role on the world stage. The fact that Monash had to insist Canada take the right flank in the Battle of Amiens when the French indicated they did not have winning the war as a priority. General Currie, the Canadian took quite some convincing, the last time they had attacked under the union flag their gallant efforts had not been appreciated. At least the Canadian Flag stands as a show of sovereignty to the world in honour of their soldiers’ sacrifice; ours says to the world that we are still a deferent colony unprepared to show our independence thus 100 years later still dishonouring our soldiers. He emphasises the Americans had no stake in the Armistice of Murdos, the French contributing one cavalry unit to Palestine (under Australian command); the ANZACs, 75% of the mounted soldiers under General Chauvel in that campaign. 2018 will be a year when the great contribution of Australian soldiers to ensure democracy prevailed in the Great War will be commemorated. The 100 years since Villers Bretonneux was retaken will be commemorated with the opening of the Monash Reception and Reflective Centres at our national memorial on the Somme, France on 25 April. 100 years since the Battle of Le Hamel on 4 July. 100 years since the battle of Tzemach Israel the successful charge by 4 ALH Bde just south of the Sea of Gallilee on 24 October. The Armistice of Murdos 1 November. The Armistice with Germany 11 November. If you would like to be present where the historic events took place CLICK HERE for details. The Sydney Jewish News covered the event in their 8 December 2017 edition, see below. Roland Perry’s book is available in most major physical and online book stores in Australia.